New Mexico – It’s better on a bike! Whether you are an experienced cyclist or you haven’t been on a bike since you were eleven years old, you will thoroughly enjoy biking in New Mexico. From the high desert plains to winding mountain roads, New Mexico offers a myriad of choices for the cycling enthusiast. Imagine, topping a curve and experiencing the most intense sunset you have ever seen in your life. Peddling through nature trails replete with rabbits, chipmunks, birds of all kinds. Our abundant wildlife can easily be seen from the seat of your bike. Young or old, no matter your age, chances are if you can walk, you can ride and you will be glad you did. flora and fauna. Nothing compares to the freedom of a bike with the breeze in your face, revitalizing yet caressing. Our ride lasts about an hour as we meander across campus, through neighborhoods, in and around the groves of pine, until after dark, we make our way home. If you plan on visiting New Mexico, bring your bicycle! If you do not own one or do not wish to transport a bicycle, many tourist areas in New Mexico offer hourly and daily rentals. Exploring by bicycle will give you an insight into the area you are visiting that is just not available by car. You may decide to stop and talk to locals, or dash into a street café for a drink and a break while taking in the view and enjoying the amenities. If you are camping or staying in a downtown area, having a bicycle is ideal to easily get around. Campgrounds offer nature trails, and biking will offer exercise, nature, and mobility through the grounds. Downtown areas can be congested, expensive to park, and hard to maneuver in, so having a bicycle can be a big boost allowing you to visit and explore at your leisure. The places you will want to ride and the type of riding you enjoy doing will determine your needs. If you are going to be riding on flat ground, you needn’t spend too much, any ordinary bicycle will do. If you want to test your skills on trails and hills, a mountain bike will better suit your needs. And of course, for highway riding, you will want something with a variety of gears to help you pace your way. Red River, New Mexico. Rentals available. Small main street mountain town. Great for leisure or mountain cycling. Take your bike to the top of the ski area and have fun coming down. Santa Fe, New Mexico. Rentals available. Ride the square, explore Santa Fe’s unique side-streets and culture. Stop for a concert in the park. Albuquerque, New Mexico. Rentals available. For city cycling, of all the beautiful cities in the southwest, Albuquerque’s sun, mild climate, and striking view make it worth the peddle. Bike paths, trails, numerous bike groups and tours, many to the top of Sandia Crest. Additionally many areas of New Mexico have seasonal and annual runs. Silver City’s Annual Tour of the Gila in May is one such noted race. Featuring hundreds of cyclists from all over the world, the race has divisions for all skill levels and covers up to 340 miles through Grant County. Spectator activities are also provided. Whatever your cycling tastes and desires, cycling in New Mexico will be an experience to enjoy and remember. Always carry your water-bottle, you’re in New Mexico. Check local bicycling safety laws and ordinances. Always lock up your bike, even in the smallest town. Have your serial number in a safe place. Try to cycle with a buddy. We are traveling throughout the state, filming, photographing, meeting people, interviewing, writing articles and much, much more. 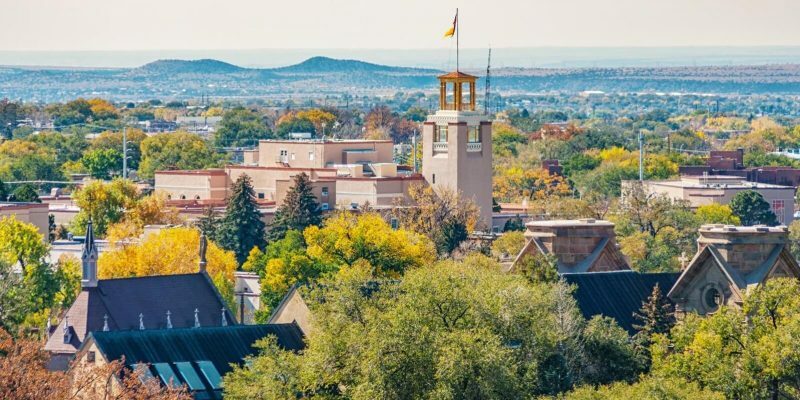 We are visiting cities and towns throughout New Mexico gathering content to share with you, our readers.